Does your program track patients with missed exams and send reminder letters to patients who missed or no-showed their baseline exam? KK/CCT: Programs should develop and implement a follow-up notification program that includes patients and providers. This can be accomplished with a database in radiology that includes a date of follow-up and automatic letters for missed follow-up appointments. Notification should also be sent to the ordering provider. A system-wide tracking mechanism for previously identified nodules in need of follow-up is a safety net for ensuring follow-up. If a follow-up is overdue then an outreach call to the provider can be performed and follow-up tracked from there as well. Certified letters to patients should be provided from the provider’s office or from the nodule team if a follow-up is not completed. BM/SR: Any patient who ever had a scheduled exam or a recommended follow-up date will fall into our reminder cycle. Thus, a patient who schedules a baseline exam and then misses it for some reason will get their first reminder letter 30 days from that date. If a patient never schedules a baseline exam, there is no date to base the reminder letters on so they don’t fall on the reminder list. If a patient missed or never scheduled a follow-up appointment for the recommended date, a reminder letter is sent to the patient 30 days thereafter. This letter informs the patient that they were due for their CTLS on or around a given date and that they should call a patient navigator to reschedule their exam, if they have any questions, or if they no longer wish to be in the program. At 60 days past the missed appointment, the same reminder letter is sent to the patient and to the ordering health care provider (HCP). This letter notifies the HCP that the patient missed their CTLS appointment and that the program was not able to reach them to reschedule. At 90 days past a missed appointment, a final letter is sent to both the patient and the HCP informing them of the missed appointment and again encouraging the patient to reschedule; however, it also notes that this is the final reminder. The patient is discharged for non-adherence once the 90-day letter was issued. CF/AR: Patients are called and receive a reminder letter. If they decline rescheduling or miss a rescheduled exam, their PCP is notified. CCT: For patients who miss appointments that are scheduled, formal attempts by telephone and in writing will be made at 30, 60 and 90 days, with the patient’s primary care provider informed and other avenues of reaching them sought. If the patient is not responding, a certified letter is then delivered to their home at 90 days indicating the attempts to reach them and encouraging their follow-up. Use a dedicated database and screening navigation to track patient appointments. Schedule an annual follow-up appointment as soon as the window of pre-authorization opens. 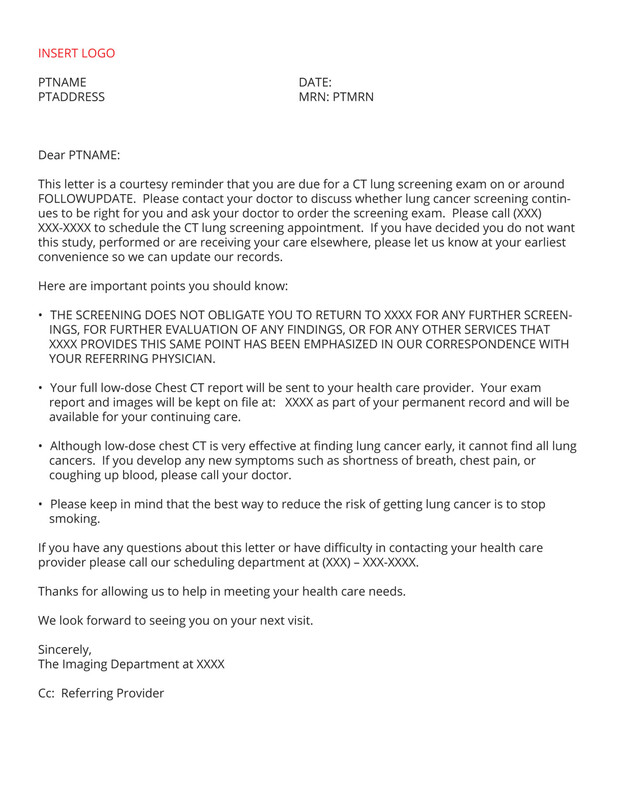 Send reminder letters 30, 60 and 90 days after screening due date to patients and physicians. Create ease of scheduling for desired location, and date and time for screening exam. Send order for future activation to the PCP 30 days before the annual date. PCP can accept the order or decline the order if the patient is not eligible anymore. Send a courtesy reminder letter to patient and provider 30 days prior to the screening CT anniversary date. Conduct outreach calls to PCP offices if screening is overdue and track completion of follow-up exams. Fill in a postcard with patient’s name, address and date of screening, and file by month. Once a month, send out the next annual prefilled reminder postcards from the file. The patient navigator sends reminder letters to patients and their referring providers one month in advance of the recommended follow-up testing. Who is responsible for managing the abnormal findings on the LCS exam? AM: Program navigators track and manage follow up for Lung-RADS™ categories 1-3. All Lung-RADS™ category 4 cases are recommended to have formal pulmonary consultation with multidisciplinary team back-up. S positive findings are managed by the ordering clinician and tracked through program navigation. KS: The radiology nurse practitioner coordinates follow-up imaging and referrals to Lung Nodule Clinic in concert with the referring provider. Ultimately the LCS program is responsible for ensuring necessary follow-up appointments are scheduled. The referring provider is notified first and given the option to manage the findings or refer to the Lung Nodule Clinic for management, which the radiology nurse practitioner coordinates. Other incidental findings are managed by the referring provider. CF: The ordering provider is ultimately responsible. To help with buy-in from our PCPs, we committed to an LCS program doctor reviewing all reports, confirming results and making sure PCPs were made aware of positive scans and any other concerning findings. CCT: The ordering provider is ultimately responsible. The abnormal finding is relayed to the program and the ordering provider/PCP are contacted as well by the nodule program. While the program offers an appointment with the nodule program, approximately one to three percent of the time the PCP declines this and manages the evaluation themselves. Regardless of the next step, all diagnostic and therapeutic care clinical is tracked by the program. Overdue follow-up imaging is tracked and the patient’s providers are notified of the need for follow-up. AR: Non-nodular findings are referred back to the PCP. Nodule abnormalities are entered into the pulmonary nodule clinic or the MDC clinic. How should abnormal findings be managed? Lung nodules? Other findings? CF: Radiology calls the ordering provider with any perceived urgent findings. CT reports are also reviewed by the LCS program physician (pulmonologist). If positive, an automatic consult with a pulmonologist in the LCS program is scheduled within three days, if possible. If negative, but there are other significant pulmonary findings, a pulmonary consult is recommended. The provider office is contacted directly for a referral. If significant non-pulmonary findings are noted, non-urgent but further evaluation is needed and the provider office is contacted by the LCS program to confirm they are aware. If urgent findings are noted, the ordering provider is directly notified (and/or other appropriate provider, if indicated), action taken and documented. This last step may be duplicative as radiology has already likely called but kept in to make sure the communication loop is completed. CCT: Abnormal findings of nodules are reported by radiology using Lung-RADS™, as well as abnormal findings but not urgent, and urgent findings. Non-urgent findings that are not nodules are reported through the EHR to the ordering provider for follow-up as indicated. An urgent finding would include both notification through the EHR and a call to the ordering provider. Does your LCS program staff track the downstream workup of the patient with findings suspicious for lung cancer (Lung-RADS™ 4)? BM/SR: Yes. These patients have the highest odds of being diagnosed with lung cancer and therefore need to be followed to resolution whenever possible to ensure they are receiving the proper follow-up and care. In addition, the presence of absence of cancer as a result of downstream Lung-RADS™ 4 workup is required to assess important program metrics including positive predictive value, false positive rate, and false discovery rate. Any complications arising as a result of the workup of LCS exam findings should be collected and reported to the steering committee. RSW/KS: Yes. The screening coordinator should monitor the work-up of these patients and make recommendations as needed to ensure the patient receives appropriate workup and doesn’t fall through the cracks. CF: Yes. All patients with Lung-RADS™ 3 or 4 are seen by LCS MD (pulmonary doctor or thoracic surgeon) for review of results and planning of follow-up (in coordination with PCP). DTC: We encourage PCPs who have patients with Lung-RADS™ 3 or 4 to be seen by either the pulmonologist or thoracic surgeon as part of LCS provider clinic. Either way, for all patients who have undergone LCS, the results of downstream diagnostic and therapeutic algorithms are recorded. This includes invasive radiology, interventional pulmonary, and thoracic surgical diagnostic procedures. Also, we track therapeutic thoracic surgery, as well as chemotherapy and radiation oncology treatment. CCT: Yes, the program tracks every aspect of diagnostic and therapeutic care for every patient with Lung-RADS™ 3 and 4. The program sees more than 95 percent of these patients, and manages the evaluation and care as well. How is data submitted to a registry? CCT: In our program, findings from the screening CTs are sent to the program nurse navigator so that each is catalogued. Those reporting elements specific to the low-dose scan technique, Lung-RADS™ reporting, and number of each level of Lung-RADS™ nodule, as well as documentation of eligibility criteria, shared decision-making and smoking cessation counseling are collected by the radiology section of our program. Those elements that are specific to diagnostic and therapeutic care, staging, and outcome are tracked by our oncology, radiation oncology, thoracic surgery and interventional radiology sections, and each of those areas are kept in a central database for the program by the nurse navigator. AR: An electronic commercially available non-dedicated spreadsheet is used or data submission to a registry. What protocol do you follow in discharging patients from your LCS program? BM/SR/CCT: An individual may be discharged for several reasons. Anyone who informs the program staff or PCP that he or she no longer wishes to participate in the screening program will be discharged. The program will notify the PCP of the reason for discharge, if given, and will document the time and date of the request for discharge in the database. Reasons for discharge include moving out of the area, inability to obtain a follow-up order from their provider, and undergoing screening or treatment elsewhere. Patients who exceed the upper age limit of the program will also be discharged. Patients will be notified of the discharge in the examination results letter and told the program will contact them if the upper age limit for eligibility is increased. For patients who miss appointments, formal attempts by telephone and in writing will be made at 30, 60 and 90 days, with the PCP informed at 60 and 90 days. If, despite these efforts, no contact can be established with the patient, the patient will be discharged. The 90-day letter notifies the patient and PCP of the delinquency, documents all previous efforts to contact the patient, and states that the program will make no further efforts to contact the patient to reschedule the appointment. The letter also encourages the patient to contact the program at any time if they choose to re-engage in the screening process. CCT/CF: For patients who miss appointments, formal attempts by telephone and in writing will be made at 30, 60 and 90 days, with the PCP informed at each of these intervals. If the patient is not responding, a certified letter is then delivered to their home at 90 days indicating the attempts to reach them and encouraging their follow-up. AR: The patient will receive three calls prior to being un-enrolled if the patient no-shows or it they develop co-morbidity that makes surgical treatment an issue.